NetherRealm Studios has announced the Injustice: Gods Among Us Season Pass which offers fans discounted DLC and exclusive content. Almost every big-name game release these days features a season pass of one kind or another. This allows players to pick up huge swaths of a given game's downloadable content, while also guaranteeing that publishers will see a larger amount of revenue from players who might otherwise pick up a single DLC pack, then lose interest in the others. It's a win-win situation for everyone (though obviously the publishers are winning just a bit bigger than fans). NetherRealm Studios' upcoming DC Comics-based fighting game Injustice: Gods Among Us is no exception to this increasingly ubiquitous trend, and details on the game's season pass were officially revealed this morning. When Injustice makes its retail debut on April 16, players will be able to purchase the Season Pass for $15, regardless of which platform they purchase the game on. 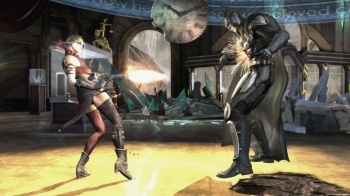 For that money, players will be granted access to the game's four downloadable characters, each of whom would otherwise be priced at $5 a piece - NetherRealm fans will recognize this DLC scheme as being almost identical to that seen in 2011's Mortal Kombat - effectively netting fans a 25% discount on these bonus fighters. Additionally, the Season Pass offers "exclusive" access to the Flashpoint Skin Pack, a small bit of DLC that features alternate costumes for Wonder Woman, Deathstroke and Aquaman. I say "exclusive," because while that's the claim made by this morning's announcement, it wouldn't be at all surprising to see the Flashpoint Skin Pack eventually appear as standard downloadable content after the game has been on store shelves for a bit. As for which DC Comics characters might be included as the aforementioned DLC fighters, that's still something of a mystery. Though we're less than a month from the debut of Injustice, NetherRealm is still periodically revealing new fighters for the title, and no one is really sure which characters will be included in the game's basic roster and which might appear as DLC down the road. For that matter, NetherRealm decide not to mention any of the DLC fighters prior to the game's retail debut, instead preferring to roll them out post-launch. Then again, once Mortal Kombat was released, it took mere weeks for fans to suss out which characters were headed to the game as DLC thanks to clever hacking and deductive reasoning, so even if NetherRealm plans to keep the lid on these fighters, it's not likely to remain a secret for long once the game hits store shelves. For now though, all we have to go on is speculation over who these fighters might be. Personally I'm hoping that NetherRealm opts for hyper-apropos post-modern surrealism and throws in a digital simulacrum of Alan Moore who attacks not with his fists, but instead with profound ideas about the very nature of superheroes and the obsolescence of the truly noble in the face of modern cynicism. Also, his beard could pull off some awesome Dhalsim-style stretching attacks.